Donald Trump brings up a toddler look-alike at a Western Pennsylvania rally Monday. 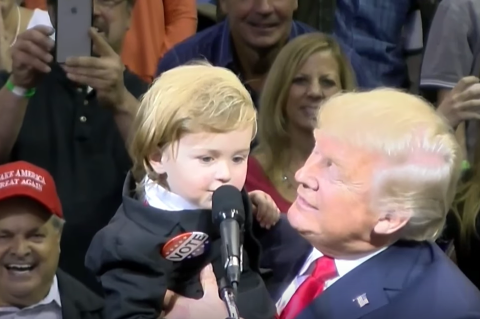 Republican presidential nominee Donald Trump took some time from his hourlong Wilkes-Barre rally Monday to bring up a toddler look-alike, complete with a wig and large "VOTE" pin. Trump saw the boy, who was held up above the crowd, and called to have him come up on stage. "Now, he's supposed to look like Donald Trump, but he's actually much too good-looking," he said to the audience. "You are really handsome." He later asked the boy, "Do you want to go back to [your parents] or do you want to stay with Donald Trump?" To which the shy boy responded, "Trump," and was met with loud cheers from the audience. Trump's Wilkes-Barre rally came a day after the second presidential debate. Watched by 66.5 million people, the debate became heated after Trump was heard making sexually aggressive comments about women in a leaked video from 2005 that surfaced last week. Dozens of Republican politicians, in Pennsylvania and across the nation, called the comments inappropriate and offensive. Many denounced their support for the candidate and even called for him to step down. About 2,500 came out to Trump's Western Pennsylvania, post-debate rally, the Inquirer reported. He largely talked about the debate, the media's coverage of the decade-old video and, of course, defeating Democratic presidential nominee Hillary Clinton, the newspaper reported. A new NBC News/Wall Street Journal poll released Tuesday shows that Trump is lagging behind Clinton, 46 percent to 35 percent. Trump hasn't exactly been known for his affection toward his younger audience members. In August, he asked for a mother at a Virginia rally to take her crying baby out of the event. Trump's Wilkes-Barre rally was also held just one day ahead of the battleground state's final day to register to vote.